I had a bunch of left-over egg yolks from making macarons and I wasn't feeling up to my usual egg-yolky things (pasta carbonara, crème brulée...)but then I remembered I had read about a pasta dough using tons of egg yolks. Or at least seven. And I had six. Perfect! It's originally from the French Laundry Cookbook by Thomas Keller, and Deb describes in detail how to make this by hand. However, I'm lazy, and I used my Kitchen-Aid for making the dough. And for rolling it out too - I love, love, love my new pasta rollers, it makes everything so much easier than a hand-cranked pasta machine. 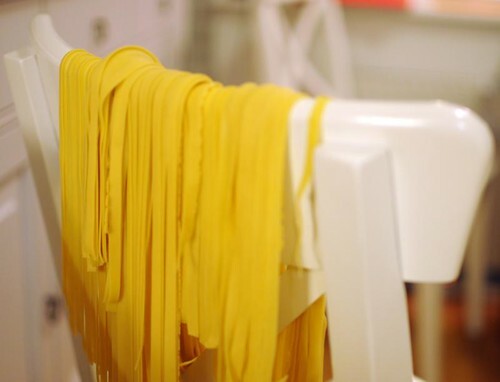 Now I just need to get a proper drying rack, because placing the finished pasta over a chair.. well, it isn't ideal and I had to spend a bit of time separating it at the end. Anyway. It's easily the best pasta dough I've made - so soft and silky, and very easy to work with. Well worth all those yolks! If you want to make it by hand - start by mouding the flour, and make a little well where you pour the egg yolks, the whole egg, the oil and the milk, and slowly stir with your hand until all the flour is incorporated. Knead for at least 10-15 minutes. Or just use your stand mixer. Add everything, mix on low speed until you have a supple dough. Hand-knead for a few minutes to make sure you have a good texture. Wrap in plastic, and let the dough rest for 30-60 minutes at room temperature. You can prepare it in advance and rest it in the fridge, but let it come to room temperature before rolling it out. Roll it out using pasta rollers (or just a rolling pin) and cut according to taste. I made tagliatelle. Boil in generously salted water for 2-3 minutes. Toss with a good sauce, or just butter. Enjoy.